A man has told the shocking story of how he was kidnapped by suspected Fulani herdsmen in a community in Edo state. 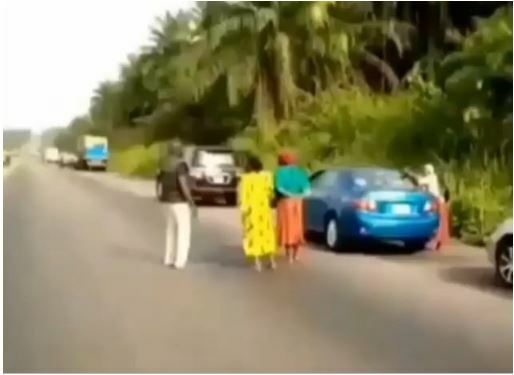 Femi Ogedengbe, a Nigerian filmmaker and actor, has taken to social media to narrate on behalf of a victim, his horrifying experience at the hands of gunmen alleged to be Fulani herdsmen over the weekend in Edo state. "Oh Nigeria! I weep… ARMED ROBBERY AND KIDNAPPING BY ARMED FULANI HERDSMEN ON ORE-BENIN EXPRESSWAY – OFOSU (INCIDENT HAPPENED AROUND 3 PM LAST SATURDAY MARCH 16, 2019). For my personal safety and to avoid reprisal or repeat attack, God forbid, let me call myself Barrister A. "I was on my way to Jattu, near Auchi in Etsako West Local Government Area of Edo State Nigeria for my younger sister’s traditional marriage billed to take place in Jattu. "I set out from Lagos and was having a very smooth ride until I entered Edo State. At Ofusu just before Okada Town, I noticed that the cars and tipper in front were driving in a zigzag manner. I applied my brakes and a sienna car that was beside me Also tried to brake and hit me on my side and forced me to hit the keb we struggled until the vehicles came to a halt. I raised my head to find out what was happening and got the scare of my life. Young Fulani men armed with AK47 riffles were shooting at us. I tried to reverse my car they were also behind shooting. A large number of vehicles were trapped in between. "As I tried to open my door one of them came to my side pointing an AK47 at me. I quickly raised up my hands and pleaded with him not to shoot. I gave him my wallet which he collected and put in his pocket. "As I was alighting from my car another Fulani man charged at me with his dagger. I begged him not to stab me. He pushed me to the side of the road and into the bush. They also took other people hostage. "Due to the challenge I have with my legs I was just falling and getting up and they were dragging and threatening to kill me if I did not move. Luckily for me I was wearing pressure stockings on my left leg. When one of our abductors saw it he asked what was wrong with me. I told him that my leg was broken, hence the difficulty in walking. He offered his shoulder for me to lean on while traversing the bush. The other abductees were taken by others in front and two of them were assisting me to walk while one gave a safe distance behind us. They were strategic! "Whenever I tripped and fell they threatened to kill me. I was begging throughout. At a point I asked one of them, that appeared a bit friendly, to please leave me as I was slowing them down, he said no that their oga said they must bring me and that if I refused to move they should kill me. When they realized that I truly had challenged with my legs another joined the one assisting me. I held them both on their shoulders while I struggled to move. They must have taken me for about three kilometers into that bush when suddenly they heard the sound of a motorcycle. One gave the order to seize the okada. They jumped on the road and ordered the farmer to stop, pushed him down and collected the motorcycle. "We met the other abductees on the way lying face down. There were two women and five men. The men were being beaten with heavy sticks. They rode past them and took me to a tomatoes farm. I came down and was asked to sit down. I immediately obeyed. They warned me to stop looking at their faces or else they would kill me. I begged for my life like I have fever done before. "While seated one of them came to me told me “oga we done kidnap you and your money na N100 million”. Unconsciously laughter escaped from my mouth and the guy said “oga if you laugh again I go kill you”. I said “sorry oga na mistake I no laugh no vex”. He asked how much I was ready to pay as ransom? I told him that I did not have money but that I could ask my brother to raise N500,000 for them. The guy said I was mad and that they did not come to the road for that kind of money and that the last they would take is N50million and that if I refused to pay they would kill me. I kept pleading. He got angry and walked away and took another abductee for profiling. They were taking the abductees one by one into the bush for questioning and beating the men with heavy sticks on their backs and head. "He asked where I was coming from, I told him Lagos and that i was going to Auchi for a marriage ceremony. He asked where I was from I told him Auchi. He got angry and corked him gun again threatening to kill me that people from Auchi always deceive them by saying they don’t have money and once they are released they find out that they are rich. At this point I was trembling and told him that I am actually from Jattu not Auchi! "They continued questioning all the abductees. I kept reciting Psalms 91 and 23 and was praying seriously under my breath. At a point they left us alone and went a distance from us. They were making calls. "Suddenly they returned and asked who could ride a bike amongst us. A young man amongst us said he could ride. One if them came to me and said take your phone. He returned one of my three phones taken from me. I could not believe my ears. He gave it to me and asked me to pocket it , and I did. "The young man started the bike and the instructed two of my co-abductees to carry me on the bike and said we should go straight that we will hit the Express road. The eight if us were released just like that. It was divine intervention. The release was after over three hours with them. "I was asked to wait for the DPO Ofusu police station to come to the scene. We waited for a while, he did not show up. I had to leave the scene as night was fast approaching. Two people died in this incident." May God help that country .